EghtesadOnline: Iranian companies are trying to follow suit and catch up with the global trend of promoting and offering organic food products, with several startups connecting consumers directly with producers based in rural and underdeveloped areas. The current trend covers various fields such as seafood, agricultural products, as well as organic delicacies. Several business ventures have been launched in different provinces intending to supply local products nationwide. Hormozmahi is an online shop for seafood based in the port city of Bandar Abbas, capital of Hormozgan Province, on the southern coasts of Iran. The startup has freshly caught fish and shrimps on sale, according to Financial Tribune. Orders placed by residents of cities except Bandar Abbas are delivered by airlines, the rail system or buses, with the customer getting charged in proportion. Local orders are distributed by Hormozmahi delivery vehicles, reported local tech blog ICTStartup.ir. Winner of the 9th round of Iran Web and Mobile Fair, Mahidarya is a website offering services similar to Hormozmahi, throwing in seafood dish recipes as a treat. 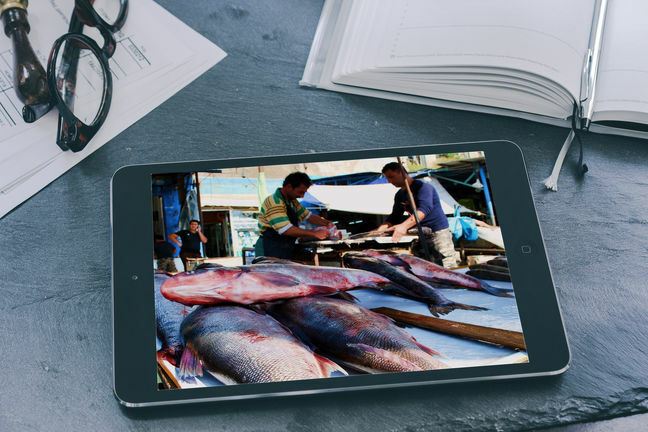 There are other rivals in the seafood sector namely Onlinemahi, Mahibazar, Zoodfish, Tihow, Mahibandar, Mahimart and a smartphone application dubbed Fishapp. The startups active in the field are not limited to those based close to the warm sunny southern shores of Iran. Farmers and business people from all across the country have made a foray into the field. For instance, the north of Iran contains some of the most fertile lands in the country, where products such as rice and tea are harvested in abundance. This is not something to be overlooked by startup companies which seek lucrative areas with the potential to yield products with extensive target markets. Doondoon and Khoshetala are two websites that facilitate the direct purchase of rice for customers by cutting out the middlemen. Ramsarshop and Mazanimarket offer local northern items such as olives and pickled garlic cloves among other things. Another startup Khomali based in Kurdestan Province offers local products through an e-shop. Adopting eco-friendly measures, Iranian startup Keshmoon based in South Khorasan Province has ventured on building a direct bridge between saffron farmers and consumers. According to the firm's directors, Keshmoon intends to secure a better future for the saffron industry, alongside establishing a reliable source of income for the farmers. The academia has not be left out either and Sharif University of Technology has backed Mahalijat.com which provides organic products void of chemical additives. Items, as varied as honey, saffron, edible oils, spices and distillates, are listed on the online shop. One of the major firms offering organic products is Mahalifood.com which offers goods at quite reasonable prices. In recent years, international entities have expressed their concerns regarding the future of the planet, exploring for effective measures to mitigate climate change and biohazards that are wreaking havoc on the environment. The current global trends indicate, when it comes to food politics, seemingly it is no longer acceptable to be reaching for the low-hanging fruit. Taking one step closer to the given goal, the United Nations devised a plan targeting sustainable development, the European Union put forward the "Common Food Policy" scheme, and conglomerates such as Amazon took on organic markets like Whole Foods. The UN plan dubbed Transforming our World: the 2030 Agenda for Sustainable Development is a commitment to eradicate poverty and achieve sustainable development by 2030 worldwide, ensuring that no one is left behind. The clause pertaining to the planet reads, "We are determined to protect the planet from degradation, including through sustainable consumption and production, sustainably managing its natural resources and taking urgent action on climate change, so that it can support the needs of the present and future generations," wrote the UN agenda's official website. Some of the measures put forth by global institutes to support sustainable growth and mitigate environmental challenges are aimed at curbing application of chemicals in agriculture and boosting mechanisms which can empower small farmers and producers with support systems. The Swiss transnational food and drink company Nestle introduced the "Nestle Cocoa Plan" as a means to promote organic products and improve the living standards of cocoa farmers. Critics recall the era of former US president Barack Obama as one of the most influential times in American food politics, as he stressed the provision of farmers and food companies with incentives to follow sustainable policies, the majority of which got rolled back by the incumbent Donald Trump just like many other policies implemented by his predecessor. The Iranian government has also pushed ahead with plans to support sustainable growth in rural areas, both through offering agronomy services and also enhancing the information and communications technologies in villages.